In Using the WordPress Media Uploader With Custom Fields, I demonstrated how to integrate the WordPress media uploader to get a file url using the native media uploader in WordPress. In this post, I’ll show you how to create a custom meta box to house your plugin/theme specific meta data in its own meta box on the edit page/post page. The meta box we’ll be creating is shown below. Register a hook on the admin_menu action and call add_meta_box() in your function to register a new meta box. Create a function that outputs the HTML for your meta box. You passed the name of this function to add_meta_box in step 1. Register a hook on the save_post action and create a function that will save the data in your meta box to the database. The example code below shows how to create a custom meta box that saves an image as meta data with the page. 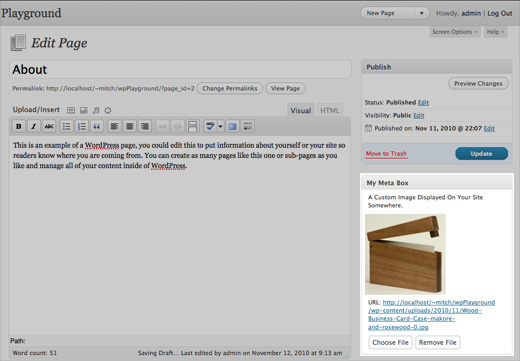 The user can upload and choose image using the native WordPress media uploader so there is no need to hunt down URLs. Note that before saving the URL, we are converting it to an attachment id. This makes the field much more useful in the rest of your theme and potentially saves space in your database. 'id'  => 'myCustomImage',  //value is stored with this as key. //get attachment id if it exists. //make sure we're saving at the right time. //Not checking for this will cause our meta data to be overwritten with blank data. //Convert URL to Attachment ID. At first glance, it looks like a lot of work, and it is. But you only need to do it once. You’ll probably want to make this into a generic code library that you can include in each of your themes or plugins that need it. For a more in depth tutorial showing how to create such a library, check out the excellent tutorial, How To Create A Better Meta Box In WordPress Post Editing Page. Let me know if this was helpful or if you had any problems implementing the custom meta box by leaving a comment below. Testing against 3.1 trunk, and getting an error, as $_REQUEST['post_id'] is not present (it is when clicking Set Featured Image) when adding this for a custom post type. Do you have a code snippet you can share? I need a little more detail to see what’s going on. After choosing an image using the uploader there is no link to add to post or use as a featured image. The image never shows up in my meta box and neither does the url. Any ideas? After you upload a new image, you have to go to the “Media Library” tab, click show next to the image you just uploaded. Here you should see the “Insert into Post” button. Let me know if this doesn’t work for you. What is the license for this code? Can I edit the code and turn this into a plugin and upload it to wordpress.org for example? Sure, you can use the code. Just include a link back to the original article somewhere. I discovered a bug and worked out a fix. If you use the attachment post URL instead of the media file URL, it fails to get the post_id on subsequent updates. //make sure we’re saving at the right time. Thank you for your correction. It helped me. Thanks for this, wasn’t saving properly for me! Hi! Thanks for this awesome script! I have trouble implementing though. I’m using the script with another which limits the meta box to a single page ID. The custom field takes the attachment ID as its value instead of the URL. Ah! Figured it out, nevermind. Thanks again! Great article. i will update my code to this approach. But how do i get the attachement in my custom Page? Hi Mitchell, great article, really helpful! It’s all up and running, however like Pedro pointed out, you can’t then add an image into the post without refreshing. He hinted at a solution to this but I’m not sure how to implement it, I don’t suppose you’re able to offer a starting point? Also, the media gallery that opens up is different from the gallery that is used for the ‘Add Media’ button, is there a way to use the ‘Add Media’ one, which feels a bit faster and hides a lot of the information? So they are more aesthetically inline with the admin interface! They were supposed to be anchor tags with a class of button as well as the input classes, but the comments section obviously eats HTML! Working with Acoustic has been a pleasure. The ideas that they came up with blew me away. All of their work was on time and very well presented. To get your free quote, simply fill out our website questionnaire and email it back to us. We’ll prepare a quote for you right away. I wholeheartedly recommend you hire Acousitc Web Design to design your website. All of their work was timely and produced great results.